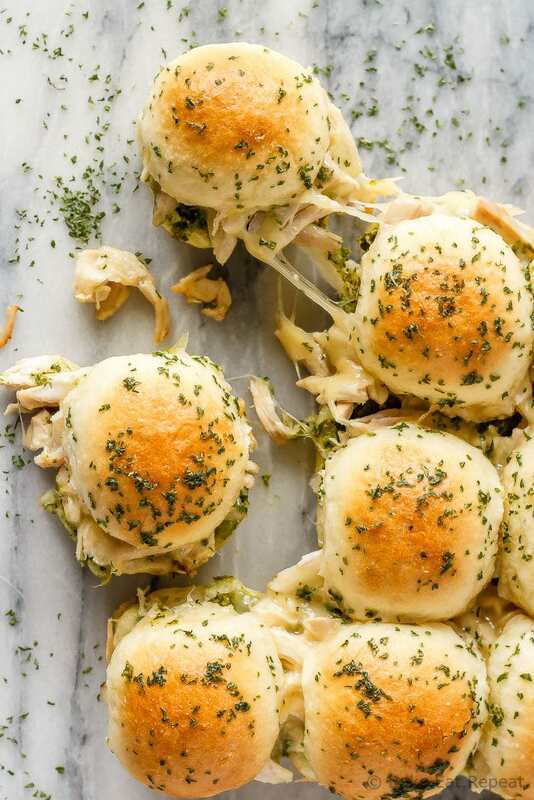 These easy to make, pesto chicken pull apart sliders are the perfect quick and easy dinner – and the leftover sliders are amazing for lunch the next day! These little pesto chicken pull apart sliders are amazing. And I don’t often say that about a simple sandwich. I don’t mind sandwiches, but they’re not usually something that I get excited about. They’ll do for lunch, but not really a meal that I often break out for dinner – unless of course we are at some kids activity or other and I need to pack supper to eat on the go! In that case, as long as everyone is getting fed something fairly healthy, I’m happy. Sandwiches are just fine. 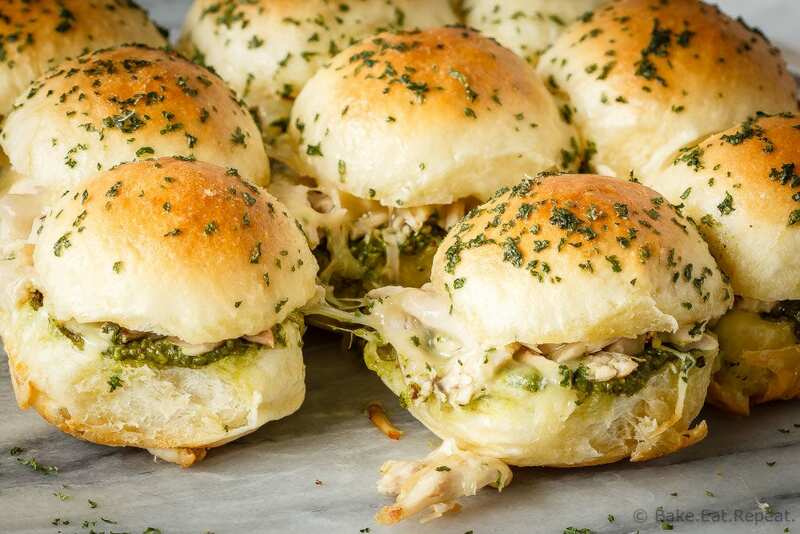 Cute little sliders served warm and loaded with pesto sauce, shredded chicken and mozzarella cheese are not just a sandwich though. And I will happily devour several of them for dinner anytime. I think it’s the pesto. I’ve decided I need to have this homemade spinach pesto on hand at all times, just so I can jazz up those boring lunchtime sandwiches. Or maybe it’s the melty mozzarella cheese. Or the garlicky butter brushed on top of the best dinner rolls. Store-bought tray buns will work just as well, but if you have time to make these dinner rolls – they really are the best! And they freeze beautifully so you can easily make them ahead of time. Or maybe I just really like baked sandwiches and that’s why I feel these are a suitable main course. Combination of the above? Yeah, we’ll go with that. 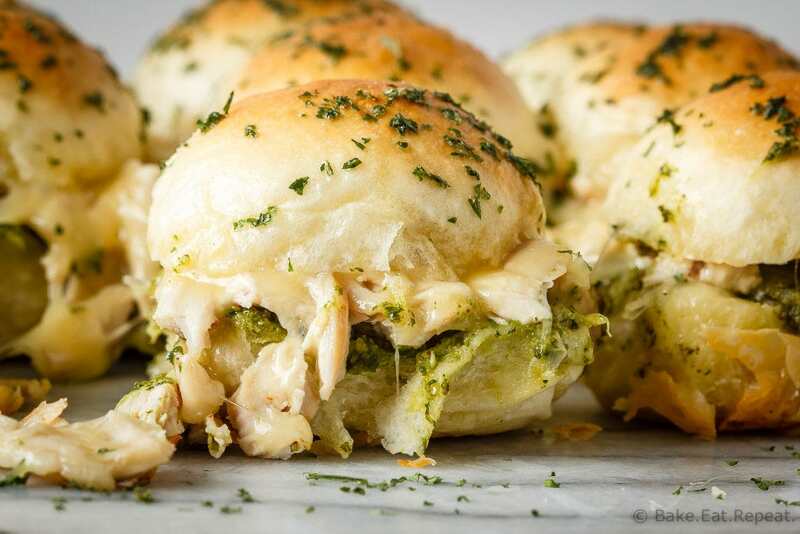 Baked, cheesy, pesto chicken pull apart sliders – fast and easy to make and everyone will love them! If you are lucky enough to have any leftovers – they also make a fantastic lunch the next day! I’ve also shared this Pesto Chicken Pull Apart Sliders recipe over on Food Fanatic. These are amazing! I made 12, not 9. My shredded chicken seemed dry so i added some mayo (would do that again). Would cut garlic salt in half. Made a few hrs before party and added melted butter mixture before baking. Baked 20 mins. Seriously....soooo good! Will be making again and again and again! These look amazing! I'm getting sooo hungry just looking at this images!